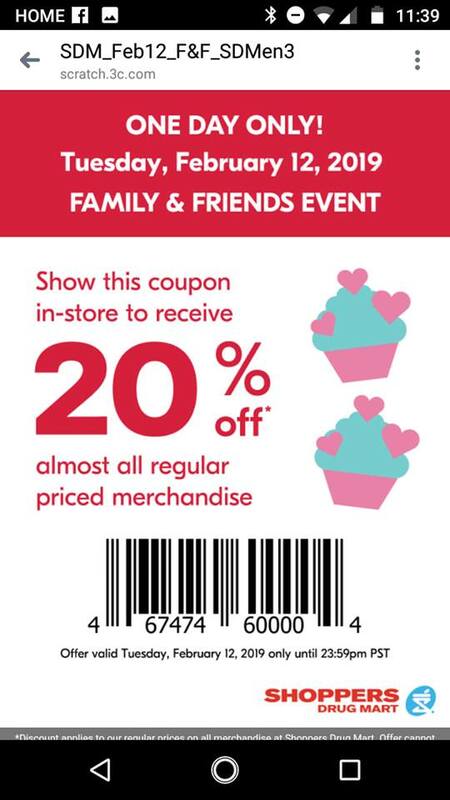 The Shoppers Drug Mart Friends & Family event is back this week! Tuesday, February the 12th only, get 20% off all regular priced merchandise when you present this offer. Should you be using this offer, don’t forget to have a look for the Quo Mini Eye Make-up Remover pads that I mentioned in a previous post. These are $5 each at regular price, and currently have a bonus of 10,000 PC Optimum points when you purchase two. If you picked up some of these and use the 20% off coupon, after tax these would still be a money maker. If you are subscribed to receive texts from Shoppers Drug Mart Canada then you have likely already received the offer by text. If you have not received it or you are not subscribed, you are able to use a screenshot of the image of above that contains the barcode. Click here to view the Shoppers Drug Mart Canada flyer for the week.